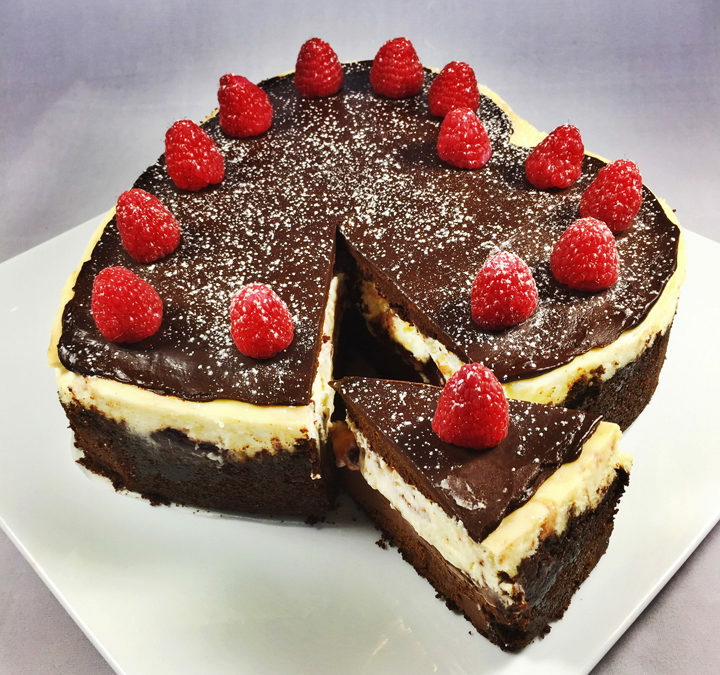 Valentines speak of love but nothing says love like our chocolate and raspberry Valentine Cheesecake. So give your sweetheart the gift of delicious with our easy to make and tasty to eat holiday treat. Chocolate crumb crust and chocolate cheesecake bottom are topped with vanilla and raspberry swirled cheesecake and then finished with chocolate ganache, a sprinkle of powdered sugar, and fresh raspberries. Preheat the oven to 350 degrees. Prepare a heart shaped or 9-inch springform pan by greasing the sides of the pan with softened butter. Line the bottom with parchment paper, and grease the parchment. Combine the graham cracker crumbs with the melted butter and using a flat-bottomed cup, press into the pan and up the sides. Bake for 15 minutes, remove from the oven and cool completely. Securely wrap 3 sheets of foil around and up the outsides of the springform pan to make it waterproof. Reduce the oven to 325 degrees. Using a microwave or a large bowl set over simmering water, melt the chocolate. Remove the chocolate from the heat and set aside to cool. Using a stand mixer beat the cream cheese and sugar until just smooth. Beat in sour cream and vanilla. Add the eggs one at a time, beating on low speed until just until combined. Remove half the batter and add it to the melted chocolate; stirring until well combined. Pour over the chocolate crust and smooth the top. In a small bowl, combine the raspberry jelly and the Chambord mixing well. Add half of the remaining cheesecake batter in three dollops over the chocolate. Add the raspberry jelly mixture over the chocolate and the batter. Add the remaining batter over top and smooth the surface. Place the springform pan in a large roasting pan and add enough boiling water to come halfway up the sides of the springform pan. Carefully place in the center of the oven and bake the cheesecake for 1 hour 15 minutes until center is just set and top appears dull. Turn the oven off, open the door for 5 minutes, then shut the oven door and leave the cheesecake in the oven, with the oven off, for another hour. Remove the cheesecake from the oven and the springform pan from water bath; remove foil. Cool cheesecake on a wire rack for 2 hours. Refrigerate overnight to chill completely. Carefully run a hot knife around edge of the pan between the cheesecake and the pan to loosen it; remove the spring form. For the topping, place chocolate in a small bowl. Heat the cream until simmering and pour over the chocolate; whisking until smooth. Cool slightly and spread over top of cheesecake. Refrigerate until set, about 15-20 minutes. Top with raspberries, powdered sugar and serve.